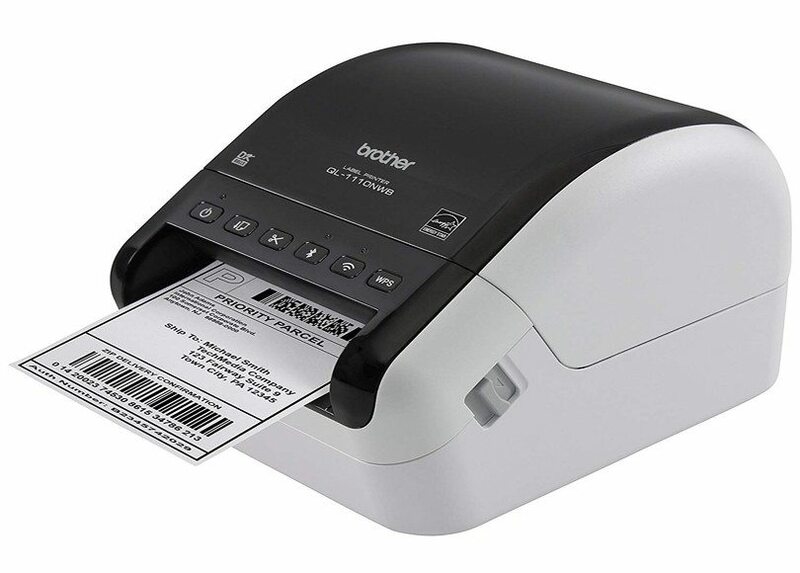 The flagship model of Brother's QL series of portable, pro-grade label printers, the QL-1110NWB ($279.99) is a step up from the Editors' Choice QL-820NWB. These two label printers have very similar feature lists and capacities, except that the QL-1110NWB can print to wider labels (4 inches wide, versus 2.4 inches). However, the smaller version offers the option for an internal battery (making it truly portable) and a few other features missing on the QL-1110NWB—enough to keep this latest QL model from taking the place of the QL-820NWB as a PCMag top choice. That said, if your work routine calls for wider labels than the QL-820NWB can produce, the QL-1110NWB will serve as an excellent, networkable label printer for your home office, small office, or warehouse. Alongside the QL-1110NWB, Brother rolled out a QL-1100 model, too, a non-networkable version of essentially the same wide-format label printer. (It lists for $100 less than the networkable model; hit the link for a review.) They both measure 6.7 by 5.9 by 8.7 inches (HWD) and weigh just under 4 pounds (3.9, to be exact). That makes the QL-1110NWB and its wide-format sibling a couple of inches wider than the QL-820NWB and about 2 pounds lighter. The 3.5-inch Leitz Icon Smart Labeling System, reviewed a few years ago, is one of only a few low-cost, wide-format direct competitors to the QL-1110NWB that I know of, and it is similar in size and weight. Zebra, mainly a maker of enterprise-level label printers, offers the pricier Zebra GC420d Direct Thermal Printer, another professional-grade, wide-format label maker. It's a little heftier and bigger than our Brother review unit, but given that Zebra rates it for a 500-label daily duty cycle, it probably needs a little more mass. The QL-1110NWB, like its smaller QL-820NWB sibling, has the widest range of connectivity options I've seen on a consumer-grade label printer. It supports Ethernet, Wi-Fi, Wi-Fi Direct, and Bluetooth. The various options allow you to design and print labels from computers on your network, or from Apple iOS and Android mobile devices. As for the printer itself, its design is simple. On the rear of the device, you'll find several ports and jacks, for power, Ethernet, USB, and USB Host (the last for connecting an external hard drive or some other USB peripheral). On each side of the printer is a lever for opening the lid that covers the paper-cartridge compartment. To replace or change cartridges, you simply slip the existing one out and drop in the new one. The cartridges are keyed so that they always load correctly, and to allow the software to identify which type and size of cartridge has been loaded in the printer. The front of the machine is where all the action is, though—if you can call it that. From left to right the front face has six buttons: Power, Feed, Cutter, Bluetooth, Wi-Fi, and WPS. Most are self-explanatory. Feed advances the paper roll, and WPS stands for Wi-Fi Protected Setup, which is a protocol for connecting the printer to a wireless router with the touch of a button on each device, without having to enter a password. As mentioned, Brother's smaller QL-820NWB supports an optional battery that, when combined with Wi-Fi, allows you to use the printer without a power source, using a direct connection to a computing device running Brother's P-touch Editor label-design and -printing software (Windows) or iPrint&Label (iOS and Android). The QL-820NWB takes all this a step further with a monochrome screen; navigation arrows allow you to scroll through and print pre-defined labels without a PC or mobile device involved at all. In other words, the QL-820NWB, with the battery installed, can operate as a standalone label maker/printer. The QL-1110NWB lacks both the battery option and a screen. Brother's P-touch Editor is a relatively full-featured WYSIWYG page-design program complete with its own font, border, and clip-art collections for sprucing up your labels. You also get P-touch Update Software and P-touch Address Book, the latter being a database program for storing contacts and creating and printing mailing labels. When you launch P-touch Editor, it queries the printer for the current label roll installed, then presents you with various label templates based on that media. If you change the label type in the printer, the current label or labels you have been working on reconfigure to fit your content on the new label size. It's all very easy, and you can import your own images and graphics. But keep in mind that, despite the machine's touted high-resolution printing, the print technology's grayscale and gradient nuances are limited. iPrint&Label works much like P-touch editor, except that it works over a wireless network protocol (Wi-Fi, Wi-Fi Direct, or Bluetooth) from your mobile device. Though it's not as robust an editor as P-touch, you can import content from your smartphone's address book, as well as graphics and photos. Like it does the QL-1100, Brother rates the QL-1110NWB at 69 labels per minute (lpm), when printing standard address labels of 2.4 by 3.5 inches. I clocked it at a close 67lpm, which was 2lpm faster than the QL-1100 and about 35lpm slower than the QL-820NWB. The Leitz Icon's score of 116lpm beat all three of the Brother machines, but its print quality wasn't as good. Keep in mind that these numbers don't include the lag time between when the computer processes and initiates the print job, because that time is mostly dependent on the speed of the PC or mobile device being used, or the network, not the printer. I ran my tests over Ethernet on our standard Intel Core i5-equipped testbed PC running Windows 10 Professional. The above print times also don't include cutting, which deals a considerable setback—of about 80 percent—to label-per-minute time. When I printed these same labels from different types of computing devices (an Android-based Samsung Galaxy smartphone, and an Apple iPad), the times varied significantly, with the PC connected via Ethernet being the fastest. Also, larger, more complex labels containing clip art or special effects take longer to process and print, of course. But almost everything I printed, except a 4-inch-by-5-foot banner, printed in well under a minute. As I said about the QL-1100 in my review, most label applications, within reason, don't require pristine print quality. My inspection of the QL-1110NWB's output showed it to be at least as tight-looking as any of the other label makers mentioned here, and in some cases a little better. I saw no fuzziness, streaks, or other flaws that detracted from the clean look of the QL-1110NWB's labels. Like all of Brother's QL-series label printers, the QL-1110NWB uses the company's DK-series label rolls. For this printer, which touts the widest print path in the series, that means you can choose among about 40 label types and/or sizes, ranging from about half an inch in width up to 4 inches. Continuous-length rolls run between 50 and 100 feet, while die-cut labels are measured by how many are on the roll. Most labels print black-on-white, with a few printing black on clear stock. While scrolling through the label-stock list, I also saw at least one 2.4-inch-by-100-foot roll that allowed for black-on-yellow. The DK-series labels are readily available online and in office-supply superstores, and the price per roll varies widely from outlet to outlet. Where you can find them in multi-roll bundles, you can often save considerably. To come up with the following per-label cost calculations, I used the prices at Brother Mall. If you print a lot of shipping labels, you'll most likely want the 4-by-6-inch die-cut size, which sells for $51.49 for 200 labels, or around 28 cents per label. A 300-pack of standard die-cut mailing labels (2.4-by-3.9-inch) runs about 9 cents per label. I'm sure that if you shop around, though, you will find them for less than this. The thing to bear in mind, as well, is that these labels are thermal paper; the printer has no ink cartridges. The technology is the same used in old-school fax machines. That means your cost of printing is simply the cost of the rolls. If you need to print labels up to 4 inches wide over a wireless or wired network, or from mobile devices, the QL-1110NWB is an excellent choice. That said, I'd like it even better if it had a battery option for using in locations without a route to AC power. Also handy would have been the ability to print pre-configured labels from a panel on the printer, as you can from the narrower-gauge QL-820NWB. We like that earlier model a bit better overall because it has those two features. But if your home, small office, or warehouse needs the wide-stock support, your best two choices are the QL-1100 and QL-1110NWB. The latter's extensive connectivity options—if you need them—make that printer the better value of the two.